When I started writing what is now called ‘From What Is to What If’, the first person I spoke to was Lucy Neal. And now, as the process enters its final editing stage, the last person I’m interviewing for it is Lucy Neal. Lucy is one of the most imaginative people I know, and is hugely skilful at bringing that imagination out into the world. She is the author of the seminal book ‘Playing For Time: making art as if the world matters‘. Her background is in theatre, and for 25 years she ran LIFT, the London International Festival Theatre (once every 2 years). When she left that, she became what she calls “a sort of maverick free floating radical”, and threw herself into the Transition movement, in particular in her neighbourhood, creating, with others, Transition Town Tooting. “I sat down for quite a while”, she told me, “and absorbed information in greater detail and depth about quite how systemic the collapses that we were undergoing at every sort of systems level. Therefore I began to very deeply question what a role could be for somebody that worked with the imagination or was passionate about our creative skills and work as artists”. 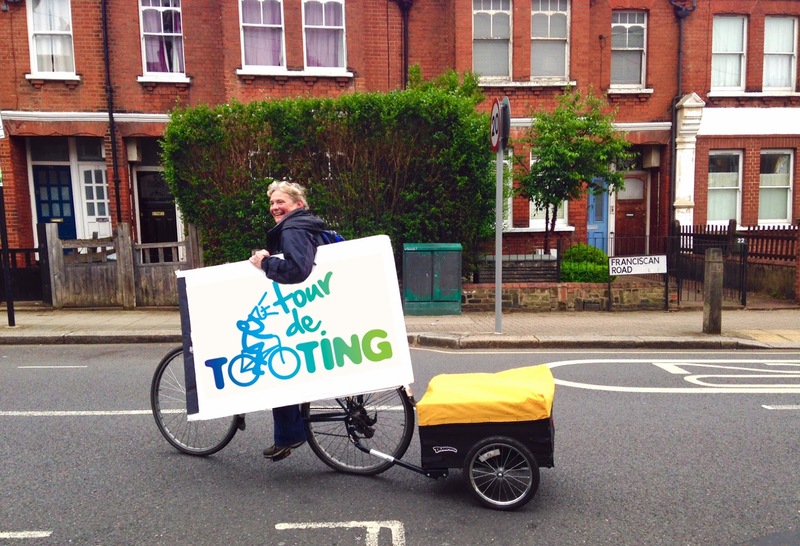 The imaginative spin on Transition that has emerged from Tooting has been deeply inspirational. Speaking of her work with TTT, she says “it has been a fabulous learning experience about where we’re at, what the possibilities are and how profoundly important I felt our imaginations were in conjuring what was possible or what could be remarkable and how we could imagine different futures”. She now works as a Creative Associate with Encounters Arts. She teaches writing at Arvon. She supports different projects that excite her, such as making London a National Park City and Aluna, which is building a monumental tidal moon clock on Greenwich peninsular. Asked to describe herself in one word she reaches for ‘possibilista’ someone who sees opportunities and then works with people across ages and culture to get them to happen and, as she says, “getting terribly excited in the process”. It feels very fitting that she is the last interview I did for this research (although not the last to be published, a couple more are in the pipeline). I started our conversation by asking Lucy what imagination means to her, and why is it so important in finding our way out of our current crises? “The imaginary helps us, transform and renew the real. That’s why it’s so profoundly important. Some time back I got really annoyed and wondered to myself where did we learn that to be positive about things was to be unrealistic? And to be negative about things was to be realistic? And every cell in my body rebels against that. Lucy leading the parade at 2017’s ‘Tooting Twirl’. I suppose it was certainly during the years of running an international theatre festival, and particularly working in the street and working in public places, one had to work across many, many sectors of the police, and the fire officers, all the agencies that were involved in public spaces, and conjure in their imaginations first what it was that we were proposing. You know, to build a raked seating in the River Thames or to light a flame out of Bankside Power Station. None of those events existed when we first went in to meetings. We were constantly laying out what it was that we were going to try and do, and painted in pictures, and slowly worked towards the event. Then once the event actually happened, and people were in awe of what it was that had happened, you realise that every single dynamic around that place and how people connected to it, and how they remembered it, and how they carried the experience, that there had been a renewal in how that place was then going to be remembered, or how the essence of that experience was going to be carried on with people. We have this remarkable ability as human beings to conjure things in our imaginations, and design them, when they’re not in evidence in front of us, but we can do that. We can bring about something new and different. It seems to me that that is possible every second of every day, in every single way. And if we look out around us, everything about the natural world is changing constantly, whether it’s the leaves on the tree, or the seasons. We live in a constantly transforming world. And that is also true of ourselves. It was Joseph Beuys, the German artist, he said ‘Jeder Mann Win Kunstler’ (“every person is an artist”), and he believed it was always happening. He called it ‘social sculpture’, about how the transformations were happening in our imaginations first. And that really to live imaginatively is no more, no less than to see that field of change, and see that field of possibilities, all the time, and at any one moment with any new encounter, or any turn of a corner, that field can be changed, and we are agents in that field. We simply do not need to accept what is around us. The status quo is just something that has settled into a pattern that day suiting various people’s interests and things like that. But I feel it’s really important to constantly be looking at it differently. Going, “Yeah, and? Well, so, and? If?” You know? Lucy teaching on ‘The Art of Invitation’ course at Schumacher College, February 2018. One of the things that it feels like you and Ruth Ben-Tovim and Encounters do so beautifully is creating those ‘what if’ spaces and asking ‘what if’ really beautifully. I wonder what makes a really good ‘what if’ question for you? Fun, actually. Fun is a very silly word but as the actor Roy Faudree once said, “Fun is a very silly word but it’s a very productive state.” If one of the essences of what we could be doing collectively at the moment is to play, to play together, to imagine what different scenarios can happen, play is the one thing that’s seriously under threat at the moment because, as you will have discovered at great length, that if we don’t feel safe, if we’re frightened, we’re not going to learn and all our cognitive capacities will become more and more narrow. To play is to learn and to open up what is imaginatively possible. It was a question that they were not expecting but could very easily answer and in answering it, found everyone else was answering it, and therefore immediately found themselves part of something and connecting remotely with a lot of other people. They had accepted the invitation and taken part in it and then entered into a whole world of other questions and activities, and found themselves affirmed in their place in the community in doing that. It was playful but it was also quite serious, you know, because one was also asking them what they were fearful of, or what they yearned for, or what they were hopeful for. What I’ve learnt is that people are so biddable and they’re so ready to engage. It’s sort of like a millimetre beneath the surface. But it appears to be very covered and sort of boundaried. But actually an invitation to join or an invitation to cross that threshold, I think it’s very, very easy actually because we’re so full of the stories of our lives. We’re very biddable about sharing them and engaging if the space is right. Transition Town Tooting’s Trashcatcher’s Carnival, the first Transition event to be funded by the Arts Council. Photo: Simon Maggs. You talk about the need for that space to feel safe. What are some of the tools or the tricks of how you give people that sense that they’re walking into a space that is safe? You’re honest. You’re present with people. If you’re the host or the person inviting that, you have to hold your intention in that quite clearly, which is that it’s a genuine offer. You’re not going to then sell them a car or something. I know you’ve spoken to Helen Marriage, but when the Elephant was in town, everyone was going, “What?! What?! What?! What? !” It’s in that moment of curiosity when somebody is caught out – this is not what they are expecting – but it’s what you do with that moment. You don’t just do that, but then it’s where that can go. Where that can go is something important collectively to hold and to guide and to frame the way in which we can then encounter each other and work creatively with each other and it’s out of that that remarkable things happen. The thing that I remain passionate about is the sort of alchemical qualities that come about when people work together creatively. Which is that I suddenly find myself surprised at doing or making something and someone else finds themselves surprised as well. It’s what people make together that is where the alchemy is. Coming back to the context in which we’re all living in at the moment, I feel deeply that we haven’t yet seen what it is that alchemically people can create and conjure with that is remarkable. I know, of course, being realistic, and we know what the physics is, and we understand the physics of what’s happening, yes, we must look at that and accept that, but it’s a kind of, “Yes, and…” These other things are also remarkable. We don’t yet know what might be possible if this happens, and this happens, and we do that, and they do that, and they do that, and they do that. Although having said that, I think at the moment we are living through a rather remarkable time. Of that, and “This is happening and…” is being called out. We don’t know. We don’t know. One of the things I’ve always loved about what you do and what you create is how you create ‘what if’ spaces, like the Tooting Twirl was such a beautiful ‘what if’ space. It was something completely different, and we’re just going to spend a day living as though that had already happened and giving you a taste. That was a good example of an invitation to people to do something differently in a place that they were very, very familiar with. This was in a part of Tooting. We don’t have a square. We don’t have a piazza. We don’t have a communal social meeting space in the middle of Tooting. We have a lot of traffic, and we have a lot of organisations focused on traffic and keeping traffic moving all the time. And that includes buses. And buses are very important. Well there you go, that’s where I get the idea that the imaginary transforms and renews the real. We desperately need as much attention. There’s one thing that I took inspiration from one day which was that I discovered – I am not a mathematician or a physicist – but I discovered that in mathematics the small letter ‘i’ denotes an imaginary number. You can’t have the square root of -3, or something, but it’s at the heart of quantum physics. At the heart of our most physics physics, if you study all the equations there are all these little imaginary i’s everywhere. But actually what he was talking about was that we need the imaginary sometimes. We need the imaginary in a functional way. It’s very functional, and it functions to go to another place in order to do something. Then when you come back to the real world, it’s kind of sorted, and it’s different. And it’s changed and it’s been transformed. And the real has been renewed. So I do see it as a very functional thing, as much as it’s magic and it’s alchemical, and you cannot really evaluate it or put your finger on it. But I actually believe it’s the most important thing in the whole wide world. So for you creating a ‘what if’ space is like creating a space where that letter i, you’re bringing that letter i into the tangible world? Into people’s experience? Yeah. You’re letting people connect. It’s not just what one person might be imagining as a possibility, but it gets very exciting when people are doing that creatively together, because that is the way you form a different kind of knowledge. You know? And that’s what we need at the moment. We need collective knowledge. We need to share our skills. We need to share what we know. That means that I have to hear you out, with what you’re imagining, because then that might spark something. And actually us working together on a project or in a scheme or in something, you and I together we will create a new kind of knowledge, and that’s what we need. We need new common knowledge. There’s an educational theorist called Vygotsky, who was a Russian, he talked about ‘scaffolded learning’. Sounds a bit technical, but zones of proximal development, which is any learner can be here but can learn that, and then a good teacher or somebody will work with people together so they help each other, and that’s called scaffolded learning. I feel that’s what at the moment society has exciting potential to experience, is scaffolded learning. But you need everybody to feel able to contribute to that. You need everybody to feel a part of that. Where we are politically at the moment, will we actually have Citizens’ Assemblies? Will we actually have where we all get together and actually the diversity of skills, the diversity of perspectives, the diversity of stories and knowledge can be shared constructively. But going back to the spaces, I think that it’s not only about the imagination, but it is also about how we connect at a heart level, as it were, profoundly and deeply to what it is that matters in our lives. And being in places where we can be convivial, peaceful, communal, creative. To me these are all like oxygen. They sort of turn the soil a bit. We need as many of those as possible I think. If I could just relate one quite interesting experience. With Encounters we have this project at the moment called Walking Forest which is looking at trees and it’s looking at mycelium and how forests think. It’s also looking at how one could shift the way the natural world is represented in our legal system and in our economic systems. It’s very inspired by the suffragettes and how incredibly creative they were. If you look at some of their actions and the creative ways they winkled their way into the streets, the shops, the musical halls, the public spaces and some of their actions. It was participatory and the invitations were fabulous. They were quite funny. On the basis of all that, Shelley Castle and I travelled to the Polish climate talks and we took with us the seed of a particular tree, which was the last standing tree from an Arboretum that the suffragettes planted near Bath. It’s just a little seed, tiny seed, and it was a seed that could be propagated and grown into an Austrian pine. The current one that’s standing – the Arboretum was cut down in the 1960s, completely, to build a housing estate in Bath – there’s one standing that was planted by the suffragette Rose Lamartine Yates. We collected some of these seeds. We made them into beautiful little gifts, and our mission in going to the climate talks was to cut across the paths of as many negotiators, ministers, those who we saw to be key players, as we could and just to find a few minutes with them where we could almost ceremoniously hand them this gift. All we did, our invitation to them, we didn’t ask anything of them at all, except that when we explained the seed and asked if we could gift it to them, that they say yes. That was all that we asked of them. Then we gave them the gift. I’m still slightly reeling at the impact of this. And realising that the seed is tiny. It’s smaller than a peppercorn. It’s an actual seed, and it could become a 500 year old Austrian pine, but more important was the imaginary role that that seed had on those people. I realised that its power was imaginary in the symbolism of the seed and the way the suffragettes planted it to symbolise the work they were doing in their day, which they would not live to see necessarily the fruits of what their campaign was about, and the impact of gifting this seed to people at COP and how immediately in a matter of seconds they identified with the intention with which the tree had been planted, and their intention, and force and courage and boldness of intention, working hard, doing whatever it was, representing the least developed countries or their work. It was instantaneous: their capacity to imagine and – well, as they reported it to us – the courage, the beauty, the depth of feeling of being gifted this seed. And coming back I realised that, yeah, on one level, we’d given them the seed of a tree. But on another level, we had given them the possibility of imagining the significance of their own work, and the courage that they needed to continue that work, knowing that in 100 or 500 years’ time, maybe, maybe, maybe, maybe something would come about as a result of the work that they were doing. I felt very humbled in those few minutes that we had with people, with the transformative energy of imagining their work as a tree that was growing. ‘Playing for Time’ pulled together a whole load of different artists and writers and creative people and looked at what they did as a particular form of practice, as imagination meets environmentalism, very sort of eclectic things that people were doing. I wonder if you could distil what you learnt from researching and writing that book about grounding the imagination or giving the imagination form or activism underpinned by imagination? I learnt that the people that are in the book, including yourself, and the people who I’ve subsequently had contact with, appreciated being identified in a sort of virtual community of an emergent practice. Because we silo our arts and we talk about visual arts and dance, or theatre, or whatever. What I learnt about ‘Playing for Time’ was practice – in the attempt to describe it through all these different people’s ways of working, combining an intention to bring about change with their creative skills and their imagination – a practice is definitely emerging which can be identified. And the hope was that in identifying it and having different people describe it, whether that’s working with land systems or with water or a notion of home and belonging or food or whatever, is that in identifying it as a distinct emerging practice that it helps to develop the practice, and it helps to develop it for it to be done more widely. Often the people practicing it, because they’re not necessarily working in conventional spaces, they’re often out and about in the field as it were, and sometimes they can feel a bit lonely. And actually the most important thing about this practice is to be working with others. And they are working with others, but what the book does is that it helps them see themselves in the context of other people doing similar work. I’ve had very heart-warming responses from people saying, “I feel part of this practice. Thank you for giving it a picture and drawing it out, and naming it.” The book was designed as a handbook, and to my amazement, it is. I heard the other day from the Gate Theatre that Ben Okri had run a poetry Japanese Renga workshop at the Gate and when I said, “Does Ben Okri do Renga?” and they said, “We followed the recipe at the back of your book.” It’s to validate it. That was the moment when I just thought the processes were so fundamentally similar about facilitating creative processes in the public realm, I was curious to know what that would look like if you did actually then completely focus on artistic and creative activity per se, you know, but within a context of what is happening ecologically. If you were elected, if you ran as the Imagination Party or something, and you ran for government and you were elected as Prime Minister Lucy next year and you had run on a platform of ‘Make Britain Imaginative Again’ – so in the same way we might have had the industrial revolution or the digital revolution, we now needed to have a national imagination revolution, a national imagination strategy, something that was completely about putting that back at the forefront of education of public life, of everything – and you were voted in and you’re sitting there in 10 Downing Street behind the desk, Theresa May is just heading out with her last box of papers and stuff, and you’re settling down, what’s the first things you might set about doing? Where would you start? I think I’d probably call it ‘Let’s Make’. I’d put a bit of an invitation in there rather than a delivery order. I think just starting humbly with the Arts Council actually. I would write a script for them that goes along the lines of “This is a climate emergency”. The sort of, “Yes, and…”, and be unashamed in just how being very bold in naming how it is that artists work, and that their role can be absolutely central to making space, building bridges, creating different alternatives and possibilities, and just make sure that there are resources for the work that could happen. That it then doesn’t have to be something else. It doesn’t have to necessarily be part of other sectors’ work. I mean there’s a lot of very good work, particularly in arts and health, or in arts and education but just being quite bold about the way in which this is a moment in time. I know there would be some resistance to that. Everyone would say, “Oh god, have we all got to do a musical about climate change?” But actually what I learnt from Playing for Time and other things like it is that the work that broadly across the country that artists and arts organisations are engaged in, there is no shortage of work that is absolutely connecting with these sorts of systems and things like that. What would be very imaginative is for sectors to work together. That’s what I would love to see. To see less siloed sectors. The point at which health is working with education, is working with food growing, is working with energy, is working with … You know, that there’s a real playfulness about these things working together and not at odds or not competitively. And working in a frame of abundance. Abundance of ideas. Austerity has done so much damage in so many different ways. It cuts out any idea of abundance at all, which is kind of nonsense, because life is enthusiastic for life. And therefore you can work with abundance. You have to keep your focus right on what is it that’s scarce and what is it that’s abundant. But you don’t want to strike abundance off your list just because, you know. Oh, I don’t know. Maybe they’re just all terrified. Probably. I would be terrified if I’d made such a mess of things. But then I’d have the decency to step off the stage. Yeah, I mean it’s the lack of self-awareness and shared working. Which is where someone like Caroline Lucas is constantly suggesting working together on things. No, I mean, one of the things that would be fantastic to do is that Transition Town Anywhere activity that we did in Battersea Arts Centre years ago where we built a town. That would be fun to do, everywhere. That could be enjoyable, and come up with some new things. ‘Transition Town Anywhere’ at the 2012 Transition Network conference. Why was that so amazing do you think? I still meet people who we start talking about it, and their eyes fill up with tears. Well I think the tears is because people suddenly found themselves very productively and creatively with a lot of other people. And they didn’t necessarily know everyone in the room and yet they had a shared making purpose. It was practical. Ruth framed the levels of story of yourself and your neighbourhood and your street and your town, so it didn’t go straight to “How are you going to rebuild your town?” but it worked. It goes back to one of your earlier questions about what makes a good invitation. It’s starting with where people are, you know. In our little Tootling Twirl we started with where people are which was right in the town centre. But in that town activity you start with where people are personally and then build up, build up, build up, build up. We know how to do these things. But it’s quite a lot of work to do them. That could be done very, very productively in a lot of different places, and also building on what everyone else is doing, whether it’s in Preston or Birmingham, or wherever it is. Well, I’ll ask you that question. Why do you think it was? People always say that thing about money only exists because we believe it, and we all agree that it’s real. That existed because we all suspended our disbelief for that time and all played it into existence. For me, the thing that I was involved in in that, where we created a brewery and a bakery in the same space, now, six years later, we’re doing that, that’s going to happen. By the summer that will be a reality. Isabella in Brazil, the thing that she played in that event she has now created in real life. There was that sense of actually we’re going to play it, and that thing about creating a vision for the future where you throw a whirlpool in front of you that draws you towards it, it felt like that. It felt like we played stuff into reality somehow. But you see what is interesting about where we’re at the moment is that we have so much knowledge and experience which we can draw on. If you look at people, like Winnicott, and the real experts in learning and play and childhood development, we know all this stuff. We know how the imagination builds lives for children. We know how to create opportunities for play. We know. We know it all. And it’s to validate it. If we validated it and got on with it… It is to do with working together. It is to do with making the spaces. We used to call it at LIFT, we used to have something called ‘deadline magic’, which is actually if you set a time or a date, and say, “Okay, now we work backwards” then you get amazing things done. That day, we had four or five hours, so you’re slightly working against the clock, but then we’re going to stop, and then you’re going to go off and have a cup of tea or a pint of beer or something, do something different. It is existing in a very distinct timeframe, but its impact afterwards is real. ‘Transition Town Anywhere’, at the 2012 Transition Network conference, Battersea Arts Centre. Arie de Geus used to talk about having a ‘memory of the future’. I’ve always seen everything I do as a pilot or an experiment for the next thing you do. So you’re constantly rehearsing and that when you play and open up different possibilities, you’re rehearsing what sort of ideas of what could happen. And then there’s this idea that when you get to that moment in time, like with your brewery or something, you’ve kind of had a scenario where you’ve thought it through, or you’ve imagined it, or you’ve felt it. It is therefore ‘memory of the future’. That’s what we do all the time. We’re playing that out every day of our lives all the time. But, no, we have fallen off some fundamental perch somewhere. John Fox said “we’ve fallen into a world where money matters”. But the evidence is that the waking up is happening quite a lot. I had a profound moment during one of the Extinction Rebellion days on the bridges. I was familiar with all the places in London, whether it was Parliament Square or Buckingham Palace or Whitehall. How many times have I been up and down those roads? And I was also familiar with all the pronouncements that were being made, with the Declaration, and the extinction, and all those facts and figures. I’m familiar with all those. That wasn’t new and the places weren’t new. What felt a profound newness to me was hearing those declarations in those places. That was a reinvention for me. It was a moment when something really kicked in for me, when I thought this is playing out now, collectively in our imaginations. The knowledge of the truth of what is being said here, but at the same time, the sort of sense of a togetherness in how people act and respond. That felt like a shift for me, in the air. There’s a wonderful account that somebody gave once of when the Pope, way back, visited Poland. A Catholic pope visited Poland and because the youth movement of the Church had stewards and youth in every town that he was visiting, the state, which was Communist, had to hand over to the youth movement of the Catholic church the stewarding for the crowds, everywhere the Pope went. So the crowds at large were being managed by young people in white T-shirts. Apparently there was a moment in time when a Russian General looked at the Head of the Polish Military and President Jaruzelski and apparently there was just a moment where they acknowledged that the public consciousness had shifted because people had been able to imagine what it would be like not to have a communist oppressive state regime, because suddenly they were all in the street with these kids in white T-shirts. It’s kind of interesting when those kinds of shifts happen. Just one last thing to say about that is that Dougie Strang told me a story about a Gaelic hero, Finn McCool, who asked his followers, “What is the best sound in the whole world?” They said things like a child laughing, or a bird in the bush, or a sword on a shield. He said those are all wonderful sounds, but the best sound in the world is “the music of what happens”. I really like that. You don’t know what can happen and it’s the music of what happens. Going back to that town activity, I think what was moving and exciting for everyone was the music of what happens. Because things were happening around us that day. And it was surprising and it was curious and it was unexpected, but such things can be staged. Measuring imagination, as in “this person’s more imaginative than that person” or any of that is very fraught with trickiness, but how would you know that the place that you lived was becoming more imaginative? How would you observe a resurgence of the imagination? What would it look like? How would you recognise it? It would be a rather lovely place to live really, wouldn’t it? Lovely, quirky things popping up on people’s walls. There’s a wall round here where somebody’s rebuilt their wall like a bit of Dali-esque bit of Barcelona. Sometimes I just go down that road and somebody’s just taken loads of broken cups and made a complete thing. One of the Gaudi houses in Barcelona. It would be invitational, and just everyday life would be delightful and where you could gather or where you could eat, or things that were offered for free that you could take part in. It would feel quite equitable. It would have spaces where people could share things. People would not feel so excluded and that would bring about a sense of purpose to the place itself, that the young and the old and the frail, everyone was involved in some way. That things happened. You could get out of bed and think, “I have no idea what’s going to happen today, but I think it might be something quite nice. I’ll go and have a look. Go round the corner and have a look.” I mean, having said that, I do live that out pretty much every day at the Lido, because as you know, at our dear Lido in Tooting there’s a South London swimming club, and we just had these Champs on Saturday, and there were about 100 volunteers working to produce that. And it’s playful. People make hats and swim in races, and they are having fun, whilst also hosting 1000 people coming to watch. There’s an element of joy and energy in the air. Joy is the word I’d find. There would be joy in the air, and I think that joy is very radical. I think joy is a radical force, because I think it connects us all to life and as I’ve said, life is enthusiastic for life. That’s what we have to hold on to is that by supporting processes of life, it’s what our job is really, isn’t it? An art that is in service to life and a way of living that is in service to life, I think it would produce joy.